The passage of time and legend had led to conflicting opinions about the character of Rob Roy. We are led to understand on the one hand that he was a rogue, and on the other, Scotland’s version of Robin Hood. The real character comes to light with a closer look at history. Rob Roy was a minor country laird owning land at Balquhidder and Aberfoyle in central Scotland. He was related to the Gregorys of Aberdeen who were eminent men according to the annals of Aberdeen University. His uncle was Professor of Surgery and Mathematics and cousins, likewise, held similar posts. Robert MacGregor (alias Rob Roy) having received a good basic education, was enrolled as a student in Aberdeen. There is, however, no record of his proceeding beyond visiting and enrolling. It would appear that his presence within the clan as scribe, writer and tutor was deemed more important than university studies, which caused a rift with the Aberdeen relations. As clan tutor, he seems to have been held in high esteem with a reputation for fair dealing and benefaction. The affairs of the MacGregor Clan took up a large part of his time, but he derived his income from dealing in cattle. He was joined by the Duke of Montrose – the former day “Secretary of State for Scotland” in a grandiose adventure in cattle dealing. When this venture failed, Montrose misused his influence declared Rob Roy a thief and a rogue, and had him outlawed, confiscating his assets. Rob Roy took to the hills and wilds of central Scotland, living off the land and did much to frustrate the Duke of Montrose by stealing from him and his associates. During this period he is reputed to have lived a “Robin Hood” lifestyle, stealing from the rich to give to the poor. With the demise of the Duke of Montrose, Rob Roy returned to his former way of life at Aberfoyle, where he continued to merit the high esteem of his clansmen until his death. One facet of his character is shown in the list of effects at his death. One item, a blind horse, is listed – a lesser character would have had it put down. Sir Walter Scott took liberties with the Rob Roy character, and time and myth have been responsible for building the romantic outlaw into a popular image. In the early nineteenth century, a whaling boat called the “Rob Roy” sailed out of Peterhead in the North of Scotland The figurehead on the prow of the boat was that of Rob Roy. This figurehead was replaced about 1850 when the ship called at Aberdeen. 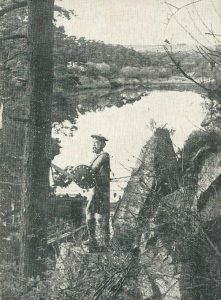 John Anderson, a carter employed by the Culter Paper Mill company, had a brother on board this whaler, and from him he got the redundant figurehead, mounted it on his cart, and proudly carried it off to Peterculter (or Culter as it is know locally), on the outskirts of Aberdeen. Two logs of wood were stuck on for legs, a pair of lead boots were fashioned, a piece of canvas served as a kilt, and the effigy was erected on the rocky prominence overlooking the Culter Burn. Culter had at this point adopted Rob Roy and the myth and legend started once again with daring feats of his jumping the gorge over which he stands guard. 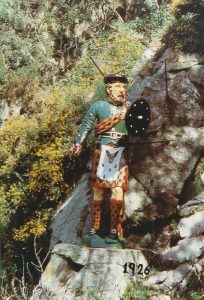 In 1865 the effigy was replaced by a properly carved wooden statue, and by now Rob Roy was well maintained with regular paint and varnish, although it did suffer the indignity of being used as target practice by the Territorials before the First World War. By 1926 a new statue was required and funds were raised for this purpose. A woodcarver called Graham, of hardgate in Aberdeen, was commissioned to carve the new statue. It was unveiled by Miss Jessie Thomson who had been present at the unveiling of the previous statue in 1865, and once again Culter affirmed its pride in its adopted son. At the outbreak of the Second World War in 1939 the population was issued with gas masks and the morning after the issue in Culter, Rob Roy was well prepared for hostilities wearing his own mask. In the 1960’s responsibility for the up keep of the statue fell upon Mr William L Gavin by whose efforts the fund was built up into a substantial reserve which ensured that the statue was kept in good condition with regular painting by Mr George F Shaw, a local painter. At a ceremony in 1987, Mr Gavin on behalf of the Trust, was presented with deeds of the rock on which Rob Roy stands by Messrs Barratt Aberdeen, in return for a token payment of one pound. In 1989 the Rob Roy statue was chosen for the Hydro Electrics Boards’ flood lighting scheme “Highlighting our Heritage”.